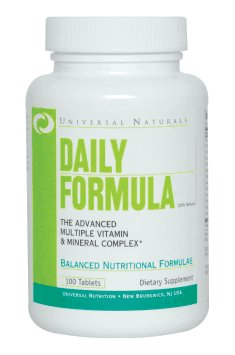 The Advanced Multivitamin And Mineral Complex! A basic, no-nonsense dietary supplement, one that all of us can use to help improve the quality of our lives. * Contains 25 required vitamins and minerals, plus a unique digestive enzyme complex. Take 1 -2 tablets a day with a meal. 1 tablet covers the needs for the majority of vitamins and part of minerals, therefore it will work great as prophylaxis and for supplementing gentle deficits. In case of poorly diversified diet and low amounts of vegetables and fruit, higher doses may be applied, 2-3 tablets a day, adjusted to the individual needs. Whey protein (whey), stearic acid and magnesium stearate, soy and pharmaceutical glaze.